UPDATE (MAY 2013). This interview was originally published in 2012, prior to Octavia’s Bookshop winning the ‘Best Children’s Independent Bookseller of the Year’ at The Bookseller Industry Awards in May 2013. Octavia Karavla owns Octavia’s Bookshop in her home town of Cirencester, which opened for business last year. Since then the bookshop has been runner-up in The Telegraph’s Best Small Shops in Britain Award. It has also been shortlisted for The Best Independent Children’s Bookshop by The Bookseller Industry Awards, whilst Octavia herself was also nominated for the Young Bookseller of the Year Award. We understand that Octavia’s Bookshop opened its doors in March 2011. What led you to open a bookshop? I have worked in children’s books for the last 10 years in Ottakars and Waterstone’s and realised soon after becoming a bookseller that I was passionate about Children’s literature and encouraging children to read. I was tempted by both teaching English and Art and so children’s literature encompassed both. I wanted to create a shop that was an amazing environment to shop in with plenty of recommendations, book groups for all ages and lots of author events. You hold a lot of events at Octavia’s Bookshop. Could you explain a little about how you organise an event? Firstly either an author will contact me or I will contact them and once a date is arranged I publicise the event in the shop on an events poster and on the website for a month or so before. Nearer the time I order the stock from the publishers, Facebook and tweet the event and send an invite out to my mailing list and also put a publisher show card in the window the week before the event. The events involving children meeting their favourite authors must be entertaining. Do you have any funny moments you’d like to share? One of the young girls in my book group came to meet an author she loved and almost hyperventilated, she was so excited. Also when Blue Peter author of the year Lauren St John signed, the queue was so big that we had to raffle them in, in the meanwhile entertaining both children and parents with flying saucer sweets! What are some of the most popular books you sell, both for children and young adults? I sell a lot of historical fiction for teens such as Hazel and Chains and a lot of animal and magical book for the 8-12s such as the White Giraffe, Running Wild and Sky Hawk. We know this is a tricky question, but if you had to pick your favourite children’s book (either a modern classic or an old favourite you loved as a child), what would you choose? 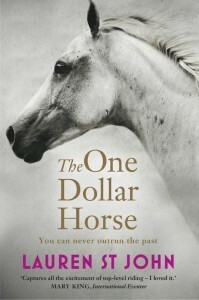 One Dollar Horse or the White Giraffe by Lauren St John. If you could choose any author (either past or present) to appear at Octavia’s Bookshop, who would you choose? Michael Morpurgo who hasn’t been or Lauren St John who has and last time signed over x100 books so is always very successful. As was Lynne Reid Banks who wrote The Indian in the Cupboard. If you weren’t running a bookshop, are there any other jobs you would like to be doing? I can’t imagine anything else I feel so lucky to be doing the job I love most and making it a successful business! To contact Octavia’s Bookshop please visit http://www.octaviasbookshop.co.uk/.